The large size of plywood sheets (8’ x 4’ US; 125 x 250 cm metric) makes construction and home improvement projects go a little faster. However, those large sheets also come with a few problems; most notably how to effectively handle the sheets given their large (awkward) size and heft— a ¾” (20 mm) sheet can weigh up to 70 lbs (32 kg). Fortunately, there are several tools, tips and jigs to assist the home DIY’er in handling these large, heavy and awkward sheets. These jigs or handles are commercially available at your local home center or readily prepared using scrap lumber from previous jobs. The home DIY’er can purchase a variety of items that all fit under the heading of ‘panel carrier’. These carriers also come a variety of prices to fit any budget; though even the most expensive items won’t break the bank. All panel carriers have a basic “J” (or hook) shape to them where the plywood rests in the bottom of the hook with a handle that’s offset for more convenient handling. These carriers range in price from $7–50 (~5–45€). The less expensive models are nothing more than a piece of plastic with a narrow slot for a piece of plywood (or drywall). The narrow slot doesn’t afford tremendous control of such a large panel and the thin plastic construction won’t win any durability contests. For the home DIY’er with only a few panels to move about… this would suffice; however, you often times get what you pay for. More robust and expensive carriers (like the Gorilla Gripper panel carrier) do give additional support as the panel is locked between two padded jaws with an offset handle; though it’s still a little awkward for someone working solo. 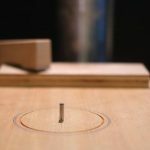 Perhaps the best way to control a piece of plywood (solo) would be to use a plywood panel carrier with wheels; this product solves two problems at once— easily moving an awkwardly sized panel and taking the strain off of your back. Even though the commercially available items are relatively inexpensive, the home DIY’er can easily construct their own panel carrier for little to no money out of scrap material or even just a piece of rope. Using rope to carry plywood is cheap, fast and effective. To make a rope carrier, take approximately 20’ of rope (~600 cm) and tie it into one continuous loop. Place one part of the loop at either end of the plywood sheet and pull the slack end taught. A picture is worth a thousand words. The image shows the rope carrier used by someone on the ground; however, this may also be used by people needing to move plywood sheets up a ladder (very awkward). To effectively move plywood up a ladder while minimizing the awkward nature of moving such a large object, begin with two of these rope carriers and put one on either side of the sheet. This creates two ‘handholds’ on either side of the panel. Connect these two handholds with a third section of rope (looped through each handhold) to carry the panel up the ladder. For the home DIY’er who wants to move panels at home with the ease and control found at the home center, then making a rolling panel carrier is pretty straightforward and can be made inexpensively with common materials. At its core, it fuses two “j” hooks with a long (4–6’ or 120–180 cm) bottom well that has casters at each corner. Again, a picture helps. Attach two 2 x 4’s at each end of a long piece of plywood (4–6’ and 5–10” wide, depending on the number of panels to carry). Insert the panels, plywood or drywall, into the crook of the J (if fitted with casters) and an individual can move multiple pieces of plywood almost effortlessly.